Join us on a 4-day/5-night adventure in one of the most stunning parts of Spain. Priority is given to those who have completed either the Intensive or Full Foundation Course. Engaging your imagination with a foreign place is powerful creatively. You start by finding out about the local area—businesses, people, culture. You then use this raw material to inspire your writing. You will work both solo and in groups. Research – we have a number of English-speaking contacts in the area for briefings on aspects of local business and culture. Group creative projects – you're asked to interpret this research material in original ways that expand your creative thinking and show some aspect of Andalucian life in a fresh light. Personal pieces – we will also ask you to write a personal, creative response to your experience in Andalucia. "I have wonderful memories of the week I was there in Spain. What I really value from my Dark Angels experience is that seeds planted during the work sessions grow slowly, and I find thoughts about writing arriving whose roots can be traced to Moniack Mhor or Aracena." "And I'd say that's the great thing about Dark Angels. You're learning by stealth, by osmosis. It's all about the people, the place, the food, the music and (of course) the wine. This large, comfortable private house is the Spanish home of writer Robin Pilcher. A working chestnut farm, it is surrounded by cork and oak forests, olive groves and the wooded mountains of the Sierra de Aracena, a national park 90 km north-west of Seville and 50 km from the Portuguese border. Nearby Aracena (population 7,000) is a small but thriving local centre of business and culture, dominated by a hilltop castle and church, and famous both for its cured ham (Jamon Iberico) and for its spectacular network of limestone caves. The whole area is steeped in history (the Moors were driven out of Aracena by the Portuguese in 1251 AD). We'll be spending one of the four evenings in Aracena. 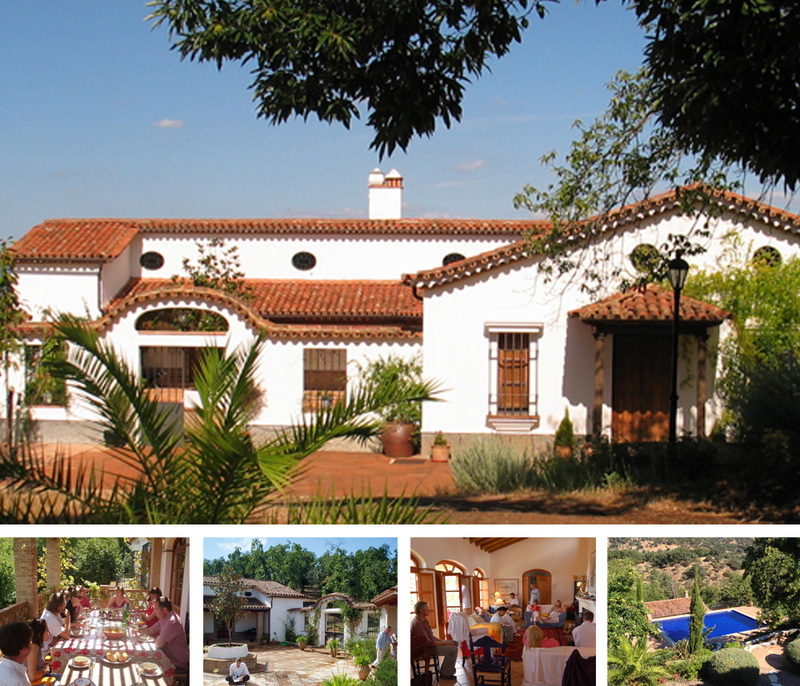 Finca el Tornero de Abajo sleeps up to a dozen people in five twin and two single rooms. Most but not all of the rooms have en suite facilities (shower or bath). Breakfast and lunch are help-yourself meals from fresh local produce brought in daily. The evening meal is prepared for us. It will still be warm in mid/late September with daytime temperatures around 24°C (75°F), though the nights are cool and comfortable. The house has a large swimming pool and there are several shaded outdoor areas for working. 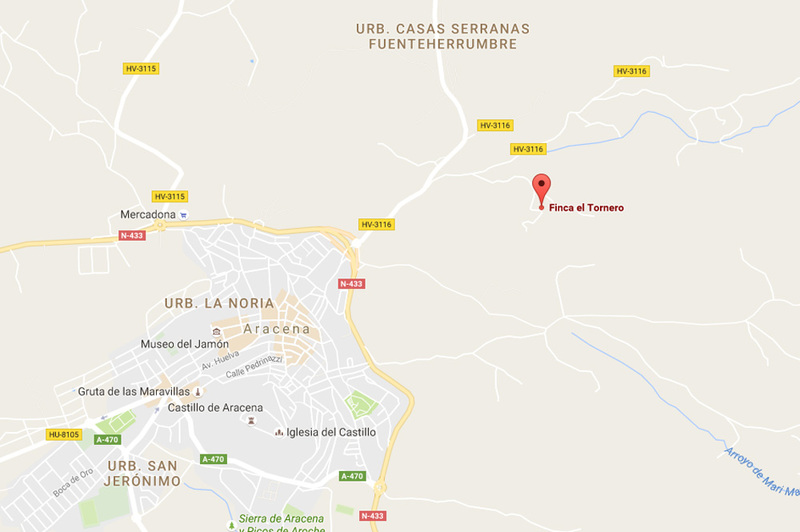 Finca El Tornero is about an hour and a half from Seville. Generally, students fly into Seville and are met at the airport by a minibus which takes everyone up to house.